I am a new user of SimScale and I was trying our some simple problems I wanted to figure out how large assemblies are analysed on SimScale more specifically how to define the connections/joints between the parts of the assembly. I gave cyclic symmetry for the revolute joints and fixed the other two supports. After running, solver error message comes up always. Am i doing anything wrong ? 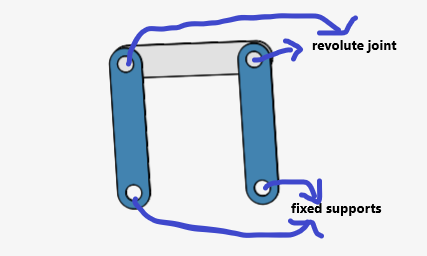 Is there any other way to define revolute joints ? Can you share a link to your project so we can take a look at it? See above the link of the project. Sorry for the late response @VigneshKC! @ggiraldo, could you give it a quick spin if you have the time? Would be awesome! Imade a copy of your project here. The Cyclic Symmetry boundary condition is used if you are modeling a sector of a revolved model such as a fan disk or a pressure vessel. What you want to use in this case is the Sliding Boundary condition. This works well for linear problems with small motion. I also had to constrain the top bar in teh Z-direction. Thanks a lot for your response. I will certainly explore more to get a better understanding.